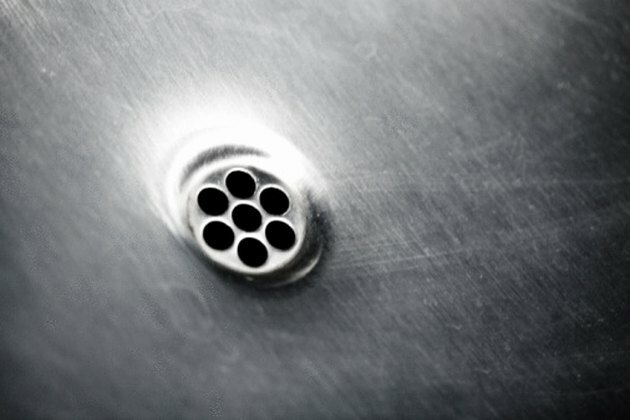 Clogged drains are virtually inevitable in households; bathroom drains generally collect hair and soap scum, while kitchen sink drains often accumulate food particles and grease. Besides foul odors, clogged drains cause water to back up, preventing homeowners from everyday tasks involving the affected sink, shower or bathtub. While many commercial drain cleaners are available, they often contain caustic ingredients that can cause dangerous chemical reactions. Salt and boiling water mixed with various natural ingredients can unclog a drain without unpleasant side effects. Promptly unclog a drain to prevent damaging plumbing pipes. Scoop any collected water out of the tub, sink basin or shower pan with a bowl. Remove as much accumulated water as possible. Sprinkle 1 cup pure baking soda directly down the clogged drain succeeded by 1 cup table salt and finally 1 cup undiluted white vinegar. Salt's abrasive texture dislodges grime, while white vinegar and baking soda form a bubbling reaction that dissolves gunk. Plug the drain's opening with an old rag while the concoction bubbles up. Let the solution work for 30 minutes. Boil 1 qt. of water during the 30-minute waiting period. Remove the old rag and pour the boiling water directly down the affected drain to flush down the concoction and loosened gunk. Test the drain by running water down it. If clogging is still evident, repeat the process.